The Hands of Sean Perry Co., an established general contractor, seeks to hire experienced lead and general carpenters. We are looking for reliable, detailed-minded, fun-loving applicants to complement our company culture. We love our jobs and it shows. Outside of work, we throw ourselves into our hobbies and passions with the same level of enthusiasm and dedication. Professional, and friendly. We work with customers and vendors whom we like and also respect, and our carpenters need to support those positive relationships. Possess refined carpentry skills, as well as an eye for detail. Understand rough and finish carpentry methods and techniques. Have strong organizational and communication skills. Support, assist, and interact well with team. Looking to stick around a while. 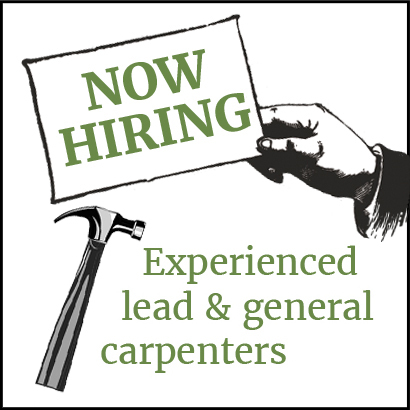 We want carpenters who want to grow with our established team! To apply, please send a cover letter and resume to hire@seanperryinc.com.